American soccer fans Laura Neff of California (left) and Kayli Westling of Wyoming (right) celebrate the U.S. women’s national team World Cup final victory with the American Outlaws outside the White House, Sunday, July 5. In the latest sign that passion for soccer is growing in the United States, several hundred U.S. supporters gathered outside the White House on Sunday night to revel in the Women's World Cup triumph of their national team over Japan. "We're doing a little celebrating at Barack's house." That was how American fan Donald Wine described the impromptu U.S. soccer rally - the biggest of its kind to be held outside the presidential residence in at least a decade. Wine heads the Washington chapter of the American Outlaws nonprofit group - the main supporter of U.S. national soccer teams. 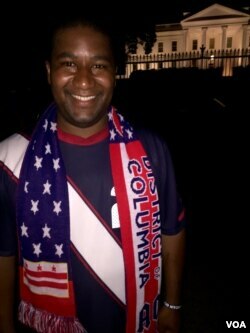 American soccer fan Donald Wine celebrates the U.S. women’s national team World Cup final victory with the American Outlaws outside the White House, Sunday, July 5. The local branch, known as AODC, is the largest of the group's 174 chapters, which have more than 30,000 members. Wine estimated that AODC drew about 500 people to downtown D.C. bar Laughing Man Tavern to watch the U.S. women face Japan in the final. Buoyed by the U.S. team's resounding 5-2 victory, almost half of the fans at the bar marched and chanted their way to the White House, just five blocks away. Police officers at the site initially instructed the fans to stay off the road beside the White House as a security precaution. As the jubilant crowds huddled on a sidewalk opposite the complex, Wine led them in a rendition of British band Queen's We Are the Champions. Several minutes later, the officers relented and allowed the fans to approach the barrier in front of the White House perimeter fence. Speaking to VOA at the site, Wine said the U.S. women's team attracted many new fans during the tournament, which he began by attending the U.S. first round matches in Canada. "The U.S. women work so hard, and to see the show of support that everybody has been giving them over the last month and last couple of years actually, has been great," Wine said. Twenty-six-year-old friends Laura Neff and Kayli Westling, who flaunted their patriotic outfits for the cameras at the White House fence, said they also noticed a rise in U.S. public interest in the women's game. "I'm really proud of how much people support it," Westling said. "I was disheartened at first when I didn't see many fans coming out to watch the U.S. team [earlier in the tournament], but by the end, they changed my mind." Neff said she believes the excitement generated by the U.S. women also will benefit the men's national team, which has never won a World Cup. "By having the women win this year, people are going to get more behind U.S. soccer. I think that is where our country is headed - getting more into soccer in general." The U.S. men will have an almost immediate opportunity to harness that enthusiasm on Tuesday when they face Honduras in their opening match of the 2015 Gold Cup - the main soccer competition of the North and Central American region. A victory in the Gold Cup final would secure the U.S. men a spot in the 2017 Confederations Cup -- the prelude to the 2018 World Cup in Russia. Wine says the U.S. men seem to be only "one play away" from winning competitive matches that could produce a World Cup trophy. "If we go further than in the 2014 World Cup in Brazil, where we played very good [to reach the second round], who knows? With that American spirit, we can do anything," he said.